by cnn.com--The cathedral has been a symbol of Catholicism and French identity for over 850 years. Its foundation stone was laid in 1163 by Pope Alexander III, and the cathedral was completed in the 13th century. Today, with its towers, spire, flying buttresses and stained glass, Notre Dame is considered a feat of architecture, as well as a major religious and cultural symbol of France. Its central spire, which tragically collapsed Monday in the blaze, was built in the 19th century amid a broad restoration effort, partly buoyed by the success of Victor Hugo's novel "The Hunchback of Notre Dame" in 1831. The cathedral draws millions of visitors. Located in Île de la Cité, a small island in the middle of the city, the cathedral is one of Paris' most popular attractions, drawing an estimated 13 million visitors a year. by catholicherald.co.uk --The roof of Notre Dame cathedral in Paris has collapsed after the building caught fire on Monday afternoon. Footage posted online shows flames engulfing the upper part of the building, including the spire and bell towers. 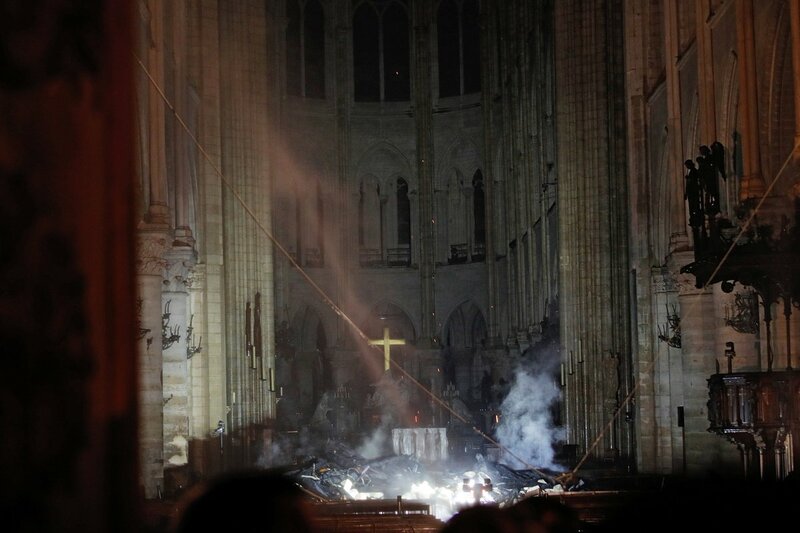 Unconfirmed reports suggest most of the major religious and artistic relics, including the Crown of Thorns, were removed as the fire began. The cause remains unclear, but officials have said say it could be linked to renovation work. • By 11 p.m., Mr. Gallet said that the structure, including its two frontal towers, had been “saved and preserved as a whole,” but that two-thirds of the roof had been destroyed. • “The worst has been avoided even though the battle is not completely won,” President Emmanuel Macron of France said, adding that he would launch a national funding campaign to help rebuild the cathedral. • The 295-foot spire, a wood-frame structure covered in lead that was built when the cathedral was renovated in the 19th century, appeared to be destroyed: After its partial collapse, the fire consumed much of the roof where the spire had stood. • Some of the cathedral’s art may have been saved because of recent renovations. Last week, for instance, 16 copper statues representing the Twelve Apostles and four evangelists were removed with a crane so that the spire could be renovated. 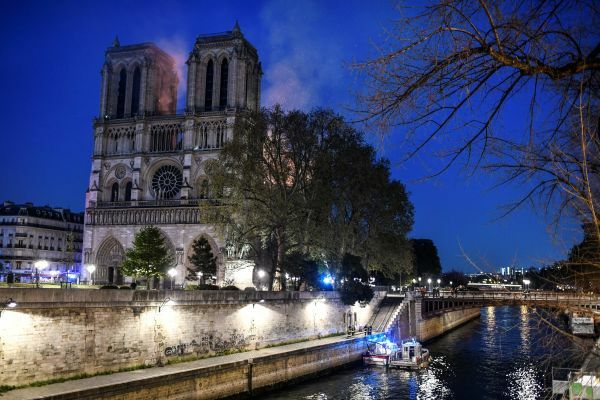 • Firefighters were able to save some of the cathedral’s artworks, including linen fabric associated with Saint Louis, the Holy Crown of thorns and the cathedral’s treasury, according to Monsignor Chauvet.